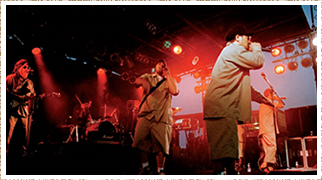 Che Fu, of Niue and Maori descent, is one of New Zealand’s most successful vocalists and is considered a NZ pioneer of Hip Hop and Pasifika music. Che was a founding member of the legendary local band Supergroove. Responsible for a string of what have gone on to become classic kiwi anthems, Supergroove generated a staggering six Top 10 hits throughout the 90s. Che has had the most Top 10 singles in New Zealand and has won most of the awards attainable in New Zealand, and a handful internationally. In addition he became the first ‘New Zealand Hologram’, performing with his hologram self at Vector Arena for TelstraClear. At the 1997 New Zealand Music Awards he won Single of the Year, Songwriter of the Year, and Male Vocalist of the Year; and in 2002 he was winner of the following categories: Top Male Vocalist, R&B and Hip-Hop, People’s Choice Award, Single of the Year, Album of the Year. In 2009 Che was presented the New Zealand Order of Merit by the Governor General for his services to music. In 2014 his contribution to New Zealand music was recognised when he was awarded the Lifetime Achievement Award at the 2014 Pacific Music Awards.